Situated on the outskirts of the Barossa Valley, only 30 mins to dog shows at SACA Park, under an hours run to Adelaide City or Football Park (home of our beloved Crows), plus some of the best restaurants in Australia, one just has to be lucky. On top of this we own eight acres and are able to enjoy our hobby of showing and breeding wire-haired fox terriers. The end result of all this is we have met and made friends with so many wonderful people, both here and overseas. Not to mention all the lovely pet people who remind us most constantly that "they have the best wire the kennel ever bred" at their home. The people we have met along the way in the show world have all added a little bit to our knowledge.Whether it be grooming, showing, breeding or just when to hold ones tongue. Just when you wonder if its all getting a bit ho hum, some young handler comes up and shows an interest to learn about wires. And that, besides breeding for the betterment of the breed, has been a goal we both strive for. To put back into the Dog World what we have taken out. We both have served on the committee of the Canine Fanciers KC for twenty-five years, Jim being President for over twenty years and both receiving our Life Membership after ten years of service. 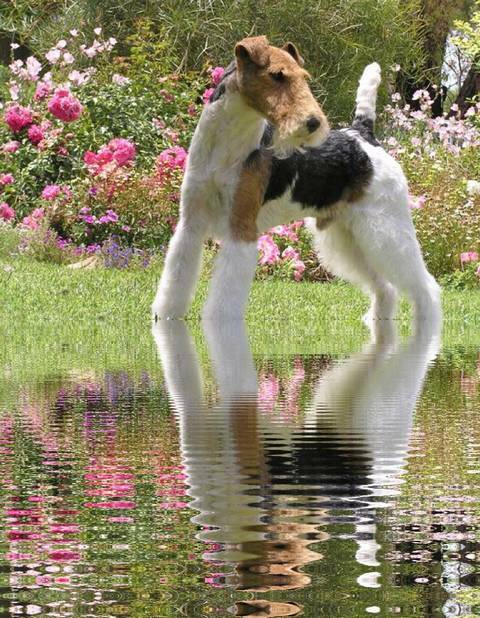 We are also Life Members of the Fox Terrier Club of SA Inc and at present Jim is the President and I hold the Secretaries position. Jim is also a Life Member of The Terrier Club of SA Inc. He also serves on the Disciplinary Committee. We thank them all for their interest, faith and all the hard work they have put into our dogs. Only being a new devotee of the computer, thanks to Mike Potts, this is my first attempt at doing a web site, thanks also to the help of "dogzonline" so I promise to strive to make it more interesting as I learn more. We welcome enquiries from anyone interested in this breed, whether for a pet, showdog, grooming or anything else we can help you with, we are only a fingertip or a phone call away.